The title is pretty self-explanatory - how much dye do you currently have and how long will it take you to use it all up (if ever ). I keep a fairly modest dye stash with three at least half-full bottles of Adore, half a bottle of Virgin Rose, and an unopened jar of Electric Lizard. Honestly, it's probably going to take me two years or more to get through it all, since I can't even get through a quarter bottle of Adore doing my whole head. Also, my roots are growing out as usual, so I'm running out of bleached hair to dye. I also on a whim got some Matrix Light Master a while ago even though I've still got some Blond Brilliance from two years ago. I'm excited to try it, but I don't know when I'll ever get around to it, since I bleach my hair twice a year at most. I will never get through my stash in the next 5 years because I have super pigmented dyes (mostly 6 Punky pots and a couple SFX now) that I highly dilute and mix to make natural blonde for my roots, toners, highlights and lowlights. So I probably use about a teaspoon of dye a month. I really should not buy anymore dyes until I use up my stash but I so love the creative process and playing with colours. I really only need one magenta, one yellow, one cyan blue and my Punky ebony and I can create any colour.. But as you know, it's always tempting to pick up more! I gave some away as I had too many. I may allow myself one more colour as a treat to myself for Christmas but then I really need to just mix up and use what I already have before buying anymore. I love to ogle new colours all the time though. Uhh...There is absolutely no way I could ever get through my entire stash. Maaaybe if I stopped buying dye today. lol. I have around(these are all guesstimates) 20 bottles of Adore, 20 tubes of Pravana/Sparks, 8 tubs of Punky, 15 tubes of Ion, 15 bottles/tubs of Manic Panic, 4 bottles of SFX, 6 bottles of Crazy Color, and then 1 or 2 each of misc. bottles like Nirvel, Stargazer, N Rage, Arctic Fox, etc. Close to 100 :/ I have a problem. I actually just tossed what I have left from my Splat collection because I don't plan on using them again anytime soon and I hate clutter. I have a box of burgundy hair color in my closet that needs to go too, but I'm holding off on that to see if I can give it to someone first. I used to have about 5 half full bottles of assorted Special Effects colors, I think it took me a couple of years to use it all up. currently all I have is a tube of Ion Shark Blue that I'm going to use within the next week and depending on how long the color lasts it probably won't take long to use it up. I sell human hair customized wigs, lace wigs and extensions so I go through color pretty fast. Ive got beyond the zone in green, yellow, purple, violet, and blue. Then half a bottle of adore rasberry and full bottles of adore aquamarine and pink rose. Then full bottles of Via Turquoise blue and emerald green. a long time.... I have several bottles of natural adore, about six partially used bottles of random pinks while I was trying to figure out this whole perfect pink thing. 5 partial bottles of special effects in uber dark colors that you need so little of, and some random MP colors, basically I have short hair so this is gonna last me forever. Considering only about 20% of my hair is bleached I don't think I could ever get through it all. So I thought I was running low on my stash, but I just went to investigate it and now I feel like a dye hoarder, lol! The only things I'm running low on are my Directions Rubine (sniff) and MP Hot Hot Pink (I just looked at my pot and it is NOT pure Hot Hot Pink, so I suspect I mixed in some diluted red dye, haha). I'm also running rather low on Punky Bright Yellow, curse you Sally's for refusing to stock the amazing MP Electric Banana!! I will probably get through my remaining dyes eventually, but with my short hair and my tendency to dilute almost every dye I use, it might take a while. Possibly a couple of years. I'm still amused that I have a half-bottle of SFX Cherry Bomb that I think I bought 4 years ago. Also, I really appreciate this topic because it's just led me to toss three dyes I know I'll never use again -- BTZ Yellin' Yellow (the world's worst yellow dye), MP Purple Haze (actually I don't think Purple Haze was even in that pot anymore, pretty sure it was a mix of dyes, haha) and MP Rockabilly Blue, which is an okay color but it just doesn't last in my hair worth beans. Now that I have Neon Blue, I'm sticking with that one. I have a large tupperware box with about 4 half used bottles of virgin rose and 3 atomic pink. I've not bought any dye since about December last year, I think I'll get through it by the time I'm 30 (maybe). I have an almost full bottle of Royal Navy, a 3/4 full of wild cherry, and a 1/2 full of Lavender (All Adore). I have a full pot of Directions violet and a 1/3 full of plum. I have smidgins of bright yellow, rose red, dark tulip and neon blue. I have an almost full pot of Punky Turquoise and a full pot of Ebony. I can't measure in cubic meters, BUT i can measure in 'boxes filled with dye'. Normally when i want to buy a haircolour, sending is VERY expensive. So when it says 'after 30,- free shipment' i am in! mostly because I also love to try out other and new colours... I have one big 'moving box' filled with dye, plus a lot on the edge of my counter where i sometimes gaze upon them for inspiration :P I think I will NEVER run out of dye.. especially because I keep on trying new ones (which also means buying new ones.. I just got 2 of my special effects deep purple and ordered another 2 of the Nirvel artx in grey.. because I had run out!).. Half pots or less of Directions - Tulip, Cerise, Rubine (2), Coral red, Rose red, Turquoise, Florescent yellow mixed with a little orange. Full pots or just a smidgen out of Directions - Vermilion red, Plum, Atlantic blue, Pillarbox red, Midnight blue, Florescent yellow, Mandarin. Half bottles or less of Adore - Cinnamon, Platinum, Fiesta fuchsia. Full bottles or just a smidgen out of Adore - Ginger, Platinum. Half or less bottles of Bleach, London - Sea punk, Washed out orange, Out of the blue. Half or less pots of Manic Panic - Siren's song, Voodoo forest, a very orange (obviously mixed) Sunshine. Half or less bottles of Special Effects - Hi-octane orange, Blue velvet, Virgin rose. Half a bottle of Stargazer - Tropical green. And three completely random custom mixes! I dunno about anyone else but I do kinda mourn the end of a bottle or tub so sometimes a little bit of colour sits there for ages as I just can't bear to use it and for it to be finally gone! I know that's really sad, but hey ho. My stash isn't very big, I only started dyeing my hair a bit over a year ago. At first I only got Manic Panic dyes because they were the easiest to come by in Spain. I still have about half a tub of Virgin Snow toner and Ultra Violet, a quarter of New Rose, and a little bit of amplified Cotton Candy pink. Then I switched to Directions and I have almost full tubs of Cerise, Plum, Violet and Lagoon Blue and a bunch of colours I haven't used yet: 2 of Midnight Blue, 2 Ebony, 2 Alpine Green, 1 Tangerine and 1 Vermillion Red. Also recently I bought some semipermanent Schwarzkopf dark brown dye. And then little scraps of different blue dyes, I think it's mostly Atlantic blue and midnight blue. I also have half a bottle of Adore's royal navy. I mostly use Cerise + Neon blue, and I feel that I go trough them sooo fast?! I think I use maybe 1/4 of each yar every time I dye my hair. And I usually have to go trough 1½ bottle of conditioner to cover all of my hair. It's crazy! The random unlabelled mixes are my downfall lol. I have five tubs of 'brown' and three of silver/grey, that I have no idea what they are made from. I also have about a dozen tubes of permanent colour from old box dyes, no idea what I am saving them for! Random tubs that are almost empty; Directions Rubine, Plum (old formula) Poppy red, Neon Blue, Rose Red, Dark Tulip, Nirvel Grey, Pravana silver Tubs that have a useful amount in: Alpine Green, Flo Glow, Atlantic blue, old formula Plum (unopened, I am saving it lol) Adore Blue Black, Platinum, Mocha, Medium Brown, Bleach London Tangerine dream, Colour Freedom Silver Blonde. Dyes I actually use; SFX Deep Purple and Blue Velvet. These are still about 2/3rds full despite being my main colours for mixing pastels for about a year. @katox I'm totally the opposite as I love finishing off colours, since I hate hoarding things. So many of my colour schemes were just an attempt to use up the last bit of this or that. The exception is yellow, though, since I can actually get through a full jar of that in less than a year, so I feel I need to be a bit more frugal there. @Wicked_Pixie I wish I had the space to save mixes, but I'm so haphazard with my own hair and half the time, I'm done applying and I randomly decide to layer something else on top of some section. I can never recreate the colours that end up really nice. That was weirdly cathartic. I don't know when I would use it all; I've bought a couple of those when there was no way I'd be able to use them anytime soon then of course by the time I could I'd already changed my mind. Ah, so fickle. Seeing everyone's stash, I feel like we ought to start some type of exchange so we can all try more colours. I have an almost entirely full tube of Nirvel nutrecolor Grey, a half full bottle of Special Effects Blue Velvet, a 3/4 of the way full bottle of Special Effects Deep Purple, a full container of Punky Color Ebony, about two scoops of Punky Color Alpine Green, a bottle of Manic Panic amplified Atomic Turquoise, a container of Manic Panic Rockabilly Blue (full), a container of Manic Panic Bad Boy Blue (full), two containers of Manic Panic Electric Lizard (full and almost full), an almost empty container of Manic Panic Lie Locks, and an almost empty container of Manic Panic Virgin Snow. As you can see, lots of Manic Panic that'll probably only be used on other people's hair. I might try out the bad boy blue extremely diluted for a pastel powdery blue, but that'll be after I try silver/white. I don't know if I'll get through my collection by myself, but I have been dying a friend's hair dark turqoise with the Alpine Green and Atomic Turqoise mixed.. So those colors will probably be empty soon. I've started to dye my hair with unnatural colors not long ago, I think May or June, so I don't have many dyes, specially because my hair is thick and the first ones I tried weren't neither thick or very pigmented. So I finished them off in one go. But now I have 1/2 of SFX Deep purple and 1/3 +- of Blue Velvet and I'm proud of my little stash. And though I'm like you, @vivienne, I don't like hoarding things. With dyes, I'd really like, one day, have a little big stash. EDIT: I'm waiting for a bottle Flo Glow in the mail and I'm really excited! ^^ It's my first yellow and my first Directions dye. :D I also want to buy Rose Red and Neon Blue. I think I'll never come back to my natural hair color again! I want to take some photos to certify how "Hair Crazy" I am! Sometime I fantasize about taking a spot of each on my head all at once Brands: SFX-25, ONO-15, MP-27, Pravana-19, Punky-15, only 2 - Raw, 3 - Ion, 3 Adore, 1 - Matrix & Permanent Schwarzkopf, Pravana, Clairol, Aloxxi, Wella, Keune, Matrix, L'oreal, Davines, Roux. HOLY MOLY @g474xy_g1r7 that is insane. Now I don't feel so crazy, as I am about to purchase three more. g474xy_g1r7 wrote: I want to take some photos to certify how "Hair Crazy" I am! Sometime I fantasize about taking a spot of each on my head all at once Brands: SFX-25, ONO-15, MP-27, Pravana-19, Punky-15, only 2 - Raw, 3 - Ion, 3 Adore, 1 - Matrix & Permanent Schwarzkopf, Pravana, Clairol, Aloxxi, Wella, Keune, Matrix, L'oreal, Davines, Roux. Don't laugh but I was amused by the number of dyes I had out (15) for creating the current rainbow. There's about the same amount again tucked away underneath! Ha! That's not far off what I did this time! Wow @g474xy_g1r7! Have you tried all the One 'N Only colours? I'm always a bit tempted by them, but I'm not sure if any of them are strong enough to cover up a bad base, which is basically what I'm always working with. Yes Vivienne, I have tried All ONO with the exception of emerald green I think. I have also tried them on some pinky copper swatches and the non-pastels worked well. The Red is orange based. The Magenta and Purple and Aqua are extremely long lasting! (they smell a bit unusual to me). I love the vibrancy and they are easy to apply. I was thinking, such a great idea, I can go through my dyes and find out what I have and maybe get inspired by my dye.... Then I found out that I have like 30 pots/tubs/tubes of dye! Eep! I'm totally a dye hoarder and didn't even know it, lol! Can one ever have such a thing as too much dye??? Ah, that's good to here. The colours on the boxes and swatches didn't seem that strong and since they're in tubes, I can't have a look at the actual colour of the dye without actually buying it. Maybe I've give the Magenta a try. @WhiteRabbit, I didn't think you had so much dye, but I guess it makes sense since your hair is so short! At least it's easy to bleach so pastels are easy. I don't think I could ever use up Pretty Flamingo unless I just started using it for conditioner. 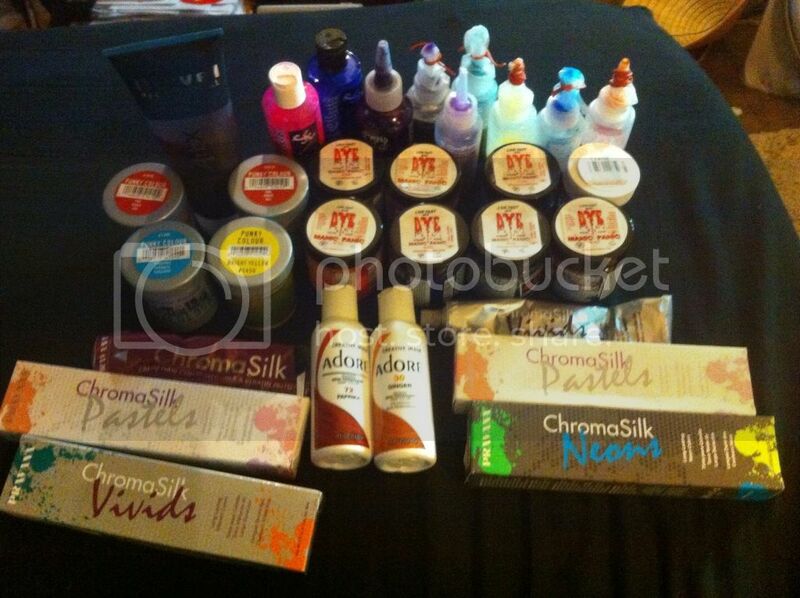 I barely use any dye at all, since I mostly pastel my hair, so a lot of my tubes and tubs are pretty full. I put a couple squirts of Deep Purple into an entire Suave conditioner bottle, and it's STILL super pigmented when I condition my hair. Ohmygoodness! Everyone has so much dye! I have the opposite problem. I only have a half pot of Manic Panic Electric Banana (I'll probably never end up using all of that...) and a half container of SFX Cherry Bomb. I have empty Ion blue and Directions Ebony containers, too, because, maybe, just possibly, I could get a little bit more out of them. I am hoping to get more Directions Ebony, some Nirvel grey, some blues, and some SFX oranges soon. I'm not sure which blues or which orange to get, though. Hopefully I'll have a stash as big as some of yours someday! I have one box, though i have another full of bleaching supplies and kits ????. Two tubs of punky Alpine green One tub of punky flamingo pink One jar of manic panic electric lizard One bottle of beyond the zone yellow Two tubs of punky violet A half empty tub of punky fire mixed with flame A tiny bit of manic panic rock n roll red One tube of ion blood orange Two tubes of ion radiant orchid Oddly enough five tubes of ion sky blue even though I hear it's almost impossible to remove One bottle of "lavender" splat that I'll never ever use again. I should probably just throw this one away so I don't destroy my bathroom or stain my hair again ???? I have two unopened bottles of SFX blue velvet, half a container of cupcake pink, more than half of a bottle of atomic pink, about 1/4 a bottle of pimpin purple and cherry bomb, and smidges of napalm . I use SFX neat...which is prolly a little mad. I need more napalm, and pimpin purple but I could prolly hold off on that for a bit. Everything but the blue velvet and atomic pink will go pretty quickly, sometime within the next 4 mo. Still struggling with stained hair!